Circles 26 and 27 at the east side of Carrowmore were lucky to escape destruction. Circles 23, 25 and 25 were completely destroyed by this quarry. Doomore cairn is on the large hill in the distance. The dolmens and circles at Carrowmore have suffered from much destruction over the last 200 years. The monuments appear to have remained intact until the decade or so before the Great Famine, when gravel quarrying and land clearance became more intensive. Colonial Landlords, who had inherited property from the wars of the previous centuries, rented the land back to tenants, usually through agents or middlemen. There was a massive drive to improve land and exploit natural resources, particularly after 1830, when many leases expired with the death of King George IV, and Landlords began have their lands cleared and fenced. Carrowmore was used as a gravel quarry and there are plenty of large pits to be seen today, where circles formerly stood. 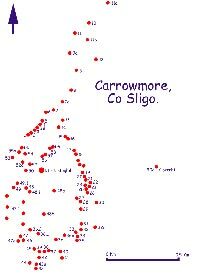 In all, some twenty seven monuments remain at Carrowmore today; there were up to sixty circles or sites originally. Their state of preservation varies considerably, from some sites, such as circles 21 and 22, which are largely destroyed, to Circle 7 which is the only complete monument. A large swaith of sites were removed on the east, south and south-west portions of Carrowmore. There are several fields which are completely clean and smooth, while the field beside it is littered with boulders. The largely destroyed monument at Site 58 may be the remains of a wedge monument. 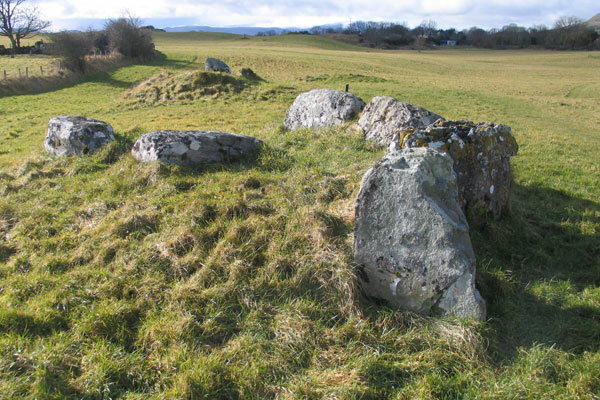 George Petrie was on hand in 1837 when several of the circles in the east side of Carrowmore had just been destroyed, and his notes are all the evidence we have of several circles. His Carrowmore records are full of entries such as: "This circle, with its fine cromleac, was destroyed within the last week (i.e. August, 1837) by Mr. Chambers of Cloon Hill." 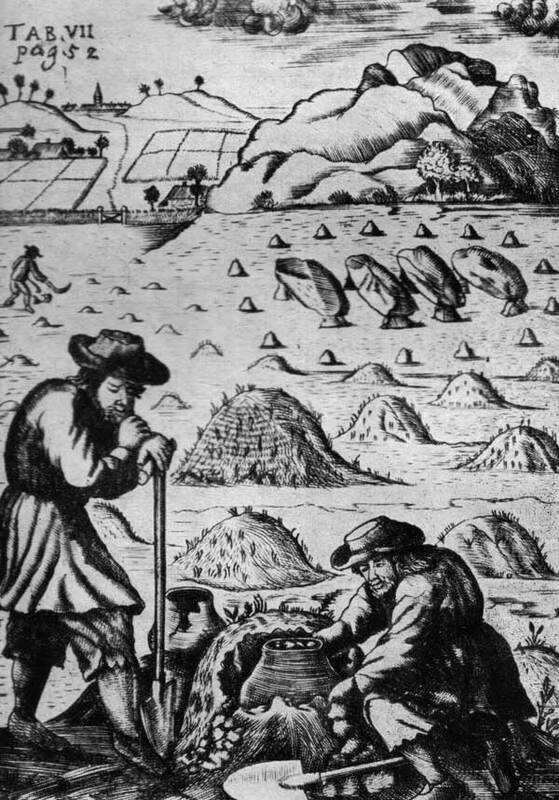 From a woodcut of 1713: two men in are taking a pot from a burial mound. Behind them are other tumuli, while in the distance can be seen a gallery grave surrounded by a stone circle. From Joseph Raftery's 1953 book, Prehistoric Ireland. In the 1980's Sligo County Council proposed to turn Carrowmore into the county landfill dump. This crazy proposal suggesting to fill the quarries with litter was overturned in the high court. The Swedish excavations were hugely important in highlighting the significance of Carrowmore, and the site is now preserved. It would be wonderful to have all the circles open to the public, as it is only by walking a circuit of the entire complex that one can get a true picture of the scale of Carrowmore. Quarrying on the west side of Circle 27 has caused many stones to fall over.